Shire Silver combines the best properties of old fashioned precious metal coins with the ease of use and convenience of more modern currencies. You can think of it as a cross between gold & silver bullion and community currencies like the Ithica Hour. Each card contains a small amount of pure gold or silver, carrying real value that has been recognized for thousands of years. Better than old style notes where the value was stored and vulnerable to central bank debasement or government confiscation, the backing is in the cards. Better than newer local currency notes, there's no need to rely on the continued existence of the issuing organization. 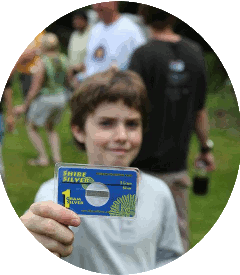 When you have Shire Silver cards, you have real value in your hands. Shire Silver is like a local currency but with global value. It is real, stable, and sound money. Old fashioned bullion coins were great for their time, but the people demanded more convenience. When paper notes came around, the market decided that convenience was more important than soundness. Initially this was OK since you could redeem the notes for the bullion if you wanted. But over time the disconnect between the currency and its backing grew. Ultimately the limitations that the backing placed on issuance of new notes was ended, with disastrous financial results. But thanks to Shire Silver we no longer need to trade off soundness for convenience. We can have both! We do like bitcoin. We like it so much we're giving you an automatic 3% discount when you use bitcoin to buy any of our products. But as cool as bitcoin is, it isn't perfect for every situation. Also, it is wise to diversify.